I am very humbled and excited to be celebrating 11 awesome years of the Get You In Shape Program since starting in Coppell. I started the Get You In Shape fitness program wanting to bring a fitness program that would attract like-minded people to form a community, helping all of us live healthier lives. I decided to share this story in hopes that it will motivate, encourage and inspire you to be, do and become more. It’s been an incredibly rewarding experience knowing that I said YES to the call and started to use my gifts in health and fitness. I now use the word WE when talking about Get You In Shape. Although I started it (with God’s wisdom), it is now “we” because of our team and community. Our Get You In Shape family is a combination of Cynthia (my awesome wife), our amazing team of trainers, our client liaison and our amazing clients (the reason why we do everything we do). Although there are some “I’s” in this story, know it is really about getting the points across and everything is a “We” now. As with most successful companies, there is a road less traveled to get there. Get You In Shape and the road that led me to start Get You In Shape certainly is one worth sharing. I am very humble with what I have been able to create and the path that God has given me. It’s always great looking back and seeing the path that I was lead to in order for me to finally start Get You In Shape in 2006. There are many different path’s from 1975 (when I was born) to 1999, but to spare you some of the unexciting details let me start at the latter. In 1999, I got my master’s degree in Health and Kinesiology, teacher certification and soon after I received my Personal Trainer Certification. For the next 5-6 years, I was able to get some incredible experience in the “game of life” and learn a lot of things that proved to help in the formation of Get You In Shape. Looking back at all the things I experienced, all the things I did, all the different steps I took, the different roles I played, they were all just pieces of the puzzle that helped put everything together. From 1998 to 1999, I was a Graduate Assistant for the Texas A&M – Commerce basketball team. 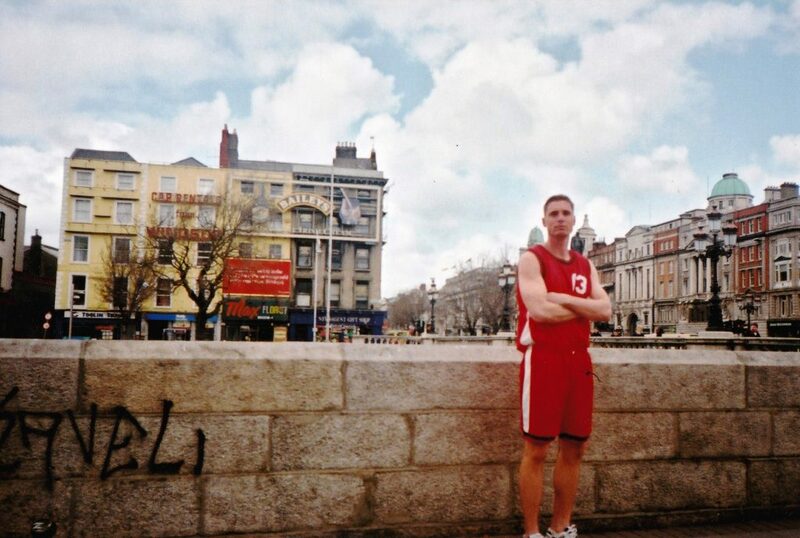 ​In 2000, I was then given the chance to go play professional basketball in Ireland for a year and also got to tour around Western Europe for a month while being over there (the all by yourself, backpack, hostel, find your way around type of travel). ​Dublin, Ireland 2000. Looking real tough in my IBA baskeball jersey on. Dublin, Ireland 2000. Looking real tough in my IBA baskeball jersey on. In 2001, after getting back from playing professional basketball, I went back to teaching at the same private school for the next 18 months. 2001 was also the year I starting taking some nutritional supplements from a direct selling company.. To this day, I still take the same core products daily which has helped me in many areas of my life (being a part of the nutrition company has been huge in my personal growth and development). In 2003, I knew that it was time for a change. It was very rewarding teaching and felt I was making a difference in the lives of the kids I taught. I knew and felt that there was much more in store for me and more lives I could change in a different way. I did not really know what that meant but did answer to the call for change and moved up to Dallas not having a job to go to and not really knowing what I was going to do. I just felt God was calling me to make a change. My first week, I decided to be a volunteer for my church’s teen program (which I ended up doing for the next 5 years) in Coppell. It was with the move to Dallas (started in Plano, then moved to Carrollton, then to Coppell) that I spent the next 2-3 years exploring “What God/I wanted to do”. 1. Got my Insurance License and sold both life and health insurance. I was an Independent Insurance Broker who was able to help people find the best fit for their individual needs. It was because of my friend I started and did this part time for a few years. I did learn a lot of communication skills while cold calling leads and meeting people for the first time that I did not know to help them decide on a health or life-insurance policy. This helped me understand what people were looking for then help them find a solution to that. 2. I became a golf caddy and caddied in groups with Payton Manning, Mike Modano, Brett Hull and a large number of business owners/CEO’s. I mainly was a forecaddy where I was positioned up ahead on a golf hole tracked each golfers' shots as each plays his or her golf ball. I also did the old-fashioned caddying which was where I would carry someone's bag and help them throughout the golf course. This was a lot of fun and also kept me in great shape. One of the biggest things I got out of this was how to serve and offer a service to people. I got to know how different personalities react and also what people respond to. Always having a servant mindset and being humble about what you do can take you a long way in life and being a caddy certainly helped me become a better person and prepared me for running Get You In Shape. 3. I worked for a brand-building company to promote different products (mainly liqueur promotions). In the end, my job was to give away a sample or something and in return ask for their contact information. It was another situation where I needed to know how to communicate with someone in order for them to get their information for the company I was helping. For the most part, this was a fun part time gig I did a few nights a week here and there. Looking back, this was another "thing" I did that helped prepare me for Get You In Shape. I had to go into a new environment, meet new people, ask if they wanted a sample or something free (mainly a sample of a particular brand of liqueur) and then ask them if they wouldn't mind filling out a contact form. It was something I got good at doing and was a mindset shift and learning how to approach people and learning how to communicate with people. 4. I was a Bartender at my roommate’s (and longtime friend’s) bar in Lewisville (Hat Tricks). Don't need to go into depth on this one to know that this is a service based position and I needed to TALK TO PEOPLE in order to be a bartender. This was another great way to learn how to communicate and how to serve. 5. I continued to benefit from using the nutrition products I was using from a direct selling company. 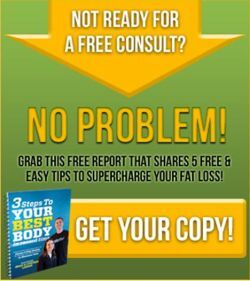 I also also consistently helped more and more people get started on programs that would help them get results with the same products I used. I continue to plug into their National Success School. This was incredible for my personal growth during this time. 6. Stayed consistent with personal training clients. This was something I just enjoyed doing. Mainly because I knew I was gifted at it and was passionate about helping people with their health and fitness. ​2003 with the Carrollton Christian Academy Basketball Team. Pictures is Lauren Crain who was my first paying personal training clients. Looking back, each of the above service jobs helped prepare me for when the door opened for me to pursue health and fitness as a career rather than a hobby. Needless to say, doors were opened and doors were closed. For some reason, I did not want to be known as a “personal trainer.” Maybe it was because I did not truly believe that I could be a personal trainer as a professional career to be able to raise a family. I also think that it was just my journey and path at the time. Most everyone knew me as “Trainer Brad” and I felt as if I had a target on my forehead that said “Ask me anything about health and fitness!” From 1999-2006, I did live my passion for health and fitness daily. People certainly knew I walked the walk and talked the talk. My only issue was that I didn't think I could ever earn a living being a "trainer" and thought I did not have the skills to succeed. I also want to be very clear that even though I had my hands in a lot of areas, I was not raking in the dough or making a lot of money. For some reason, though, I knew that what I was doing at that time was the RIGHT THING FOR ME (Jer 29:11). I was able to gain a lot of knowledge in every area of service that I did during that time. I was able to learn what people wanted (and didn’t want), I learned a lot about how to interact with all types of personalities (how to get along with people) and I was able to learn how to over deliver on service by just listening to people. In 2006, two doors opened that would eventually prove to be WHY I chose to quit everything and pursue my career in health and fitness once and for all. The first door that opened was getting my first Corporate Fitness Program (boot camp) at the University of Dallas. I had already done group training with the CCA basketball team of athletes in Carrollton but this was just bringing what I was doing with one on one training to a group session. The University of Dallas group personal training program solidified to me that I had been given gifts to be used in group fitness and that this is something that I WANTED to do. The program was a success and I had a blast personal training in a group atmosphere. The second door that opened is HOW the name GET YOU IN SHAPE started. Another guy I caddied with, Mark, worked at a television and production station and approached me with the idea of having a television show that would start with an interview and end with a fitness segment. This would also end up being a Fitness DVD with the interviews being included along with 5 different workout segments. The ball was in my court to come up with the entire programming including the fitness portion and finding the people to Interview. 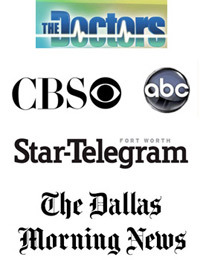 I was able to call and get interviews with some of the most well-known people in their fields in the Dallas area. Some of the interviews were the late Coach Joe Avezzano, Sidney Stohs M.D. (Professor, Pharmacology and Toxicology), Lance Walker (Global Director of Performance at Michael Johnson Performance), Everett Aaberg (Owner of Telos Fitness Center), Ken Goldberg M.D. (Founder of the Male Health Center) Meredan Zerner (Registered Dietitian @ Cooper Aerobics), and Collete Cole (has led Cooper’s Female Focus Program since 2006). These are a few of the incredible list of folks I was able to interview and learn from. For me, it all came together easily. Looking back on 2006, I can't believe I got all those people to do an interview with me. It's funny to look back on those videos because I am by far NOT a reporter or media guy. I somehow was able to come up with questions and was able to ask them on camera to complete it. God was certainly running the show. Pun intended. From this Get You In Shape was BORN! 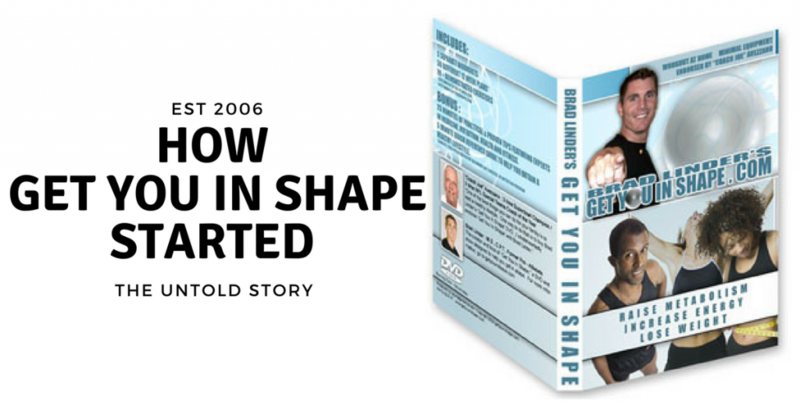 In 2006, GetYouInShape.com, LLC was formed and the rest is history. The short end to the story was that the television show never panned out. The good news, though, I was able to keep intellectual property of all the footage and the Get You In Shape Fitness DVD did come to fruition. It was and has been a great tool for many people. I had been involved in the Coppell, TX community since 2003 volunteering my time at St. Ann's for the Life Teen Program. I met my wife at that church along with a lot of the people I spent time with. ​So as the doors opened for me to help more people in the area of health and fitness, I wanted it to be where I lived and in my community, Coppell, TX. I loved leading and coaching that first Group Training Program at the University of Dallas. In the fall of 2007, I also had a few people ask me if I would start a group fitness training (fitness boot camp) in Coppell. 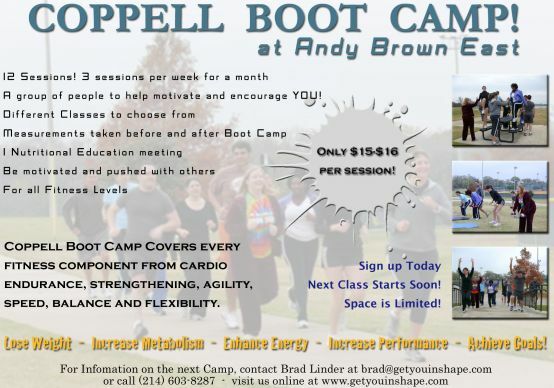 ​​I then made plans to see how I could start an outdoor fitness program (fitness boot camp) in Coppell. I reached out to the Mayor who I knew from church and he sent me to the Coppell Parks and Recreation Department. Brad Reid then sent me to the Coppell Aquatics and Recreaction Center. At the time, having an outdoor fitness camp was just something that was popular and the City had an ordanance about running a service at the Parks. After a few meetings, we came into a partnership with the City of Coppell and Get You In Shape would be the only fitness program to conduct fitness sessions in the Parks of Coppell. I reached out to some friends and clients ​to conduct a mock fitness session (they did get a free workout in) at the park to take some initial pictures for marketing a flyer and to put on the website. I got my website going as I learned about Search Engine Optimization (SEO) and began to Market. And as the say....The Rest is History which is why we are now celebrating our 11th Year Anniversary.